Being the lone vegetarian in a family of carnivores on Thanksgiving can be, well, hard. Everyone tries to make it seem like it’s not a big deal and reminds you that you can at least eat the side dishes! Until, that is, it comes to light that the mashed potatoes contain chicken broth, the green bean casserole is made with pancetta, and the stuffing is dotted with bacon. “But it’s really not that much bacon,” your cousin offers as reassurance. At least we’ll always have cranberry sauce. This year, let’s take matters into our own hands and make a totally vegetarian Thanksgiving feast with all kinds of plant-based delicious. The first task at hand is to decide what the main dish will be. Whenever I’m cooking for a room full of non-vegetarians, I try to avoid using any imitation meat products. It sounds a bit counter-intuitive, but even though Tofurkey may taste meaty to those of us who haven’t eaten animal protein in years, those who eat meat every day are definitely going to be able to taste the difference. Instead, I like to make things that are naturally meat-free so that they will not be written off as a less-delicious version of something else, but rather appreciated in their own right. In years past, I’ve dabbled in savory tarts, hearty salads and cheesy casseroles, but this year I’ve decided to learn how to strudel. Strudels are Austrian pastries with layers of crust rolled up with a filling, usually sweet (think apple strudel), but occasionally savory. As much as I love eating dessert for dinner, I decided to go the savory route for our Thanksgiving main dish. Between sweet, smoky roasted root veggies, earthy lentils, nutty pesto and creamy goat cheese, this vegetable strudel is filled with a mix of textures and flavors that all come together to taste like fall. And really, what more could you ask of your Thanksgiving dinner? Even though it seems like there is a lot going on here, don’t freak out! Most of the filling components can be made ahead of time, so on Turkey Day (Strudel Day), all you’ll have to do is pull them from the fridge, roll them up in a phyllo crust and bake for 20 minutes, leaving you more time to focus on everything else that needs to spend time in the oven—and hopefully leaving you with a few free to minutes to stop and smell the strudel in the oven. Roasted fall veggies, hearty lentils, creamy goat cheese and pecan pesto in a golden-brown phyllo crust … better watch out, turkey. This meatless main is set to steal the show. 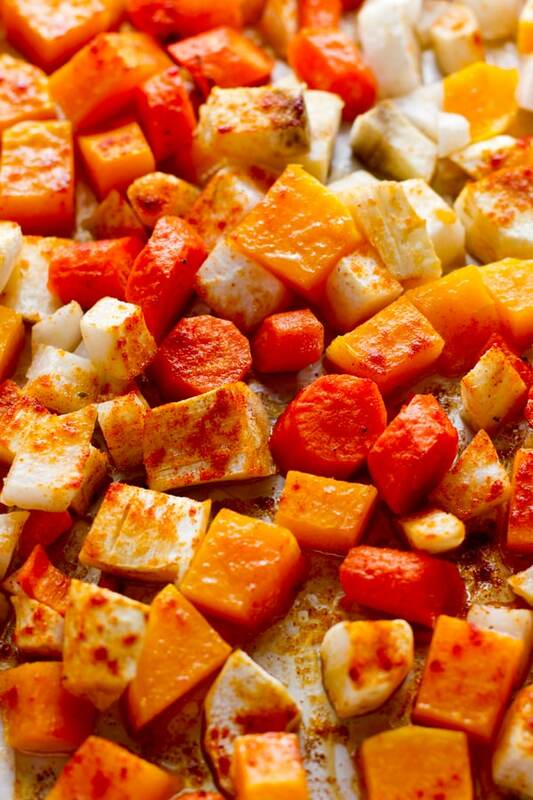 In a large bowl, toss together the butternut squash, carrots, parsnips, turnips, olive oil, smoked paprika and salt. Spread out in a single layer on a parchment-lined baking sheet. Roast, turning once or twice while cooking, until tender, 30-40 minutes. In a large pot, combine the lentils, water, and a pinch of salt. Set over high heat and bring to a boil. Lower heat to medium low and simmer, covered, until lentils are tender, 30-40 minutes. Drain and set aside. Add the pecans, Parmesan cheese and olive oil to the bowl of a food processor. Pulse until crumbly. Season to taste with salt and black pepper. Set aside. Once all of the filling components are ready, remove the phyllo dough from its packaging and cover it with a damp cloth or paper towel. The phyllo dough dries out quickly, so it is important to keep it damp and work quickly. Place one sheet of phyllo on a parchment-lined baking sheet. Brush with the olive oil. Put another sheet of phyllo on top of it and brush with more oil. Repeat with remaining sheets. Spread the roasted vegetables over the phyllo, leaving a 1-inch border around the edges. Sprinkle the lentils, pesto and crumbled goat cheese over the top. Fold the short sides of the dough in towards the center until they meet the filling. Repeat with the long sides and then roll the entire strudel lengthwise into a long log shape. Bake until golden brown, about 20 minutes. Let cool for 5 minutes before cutting into slices and serving. The roasted root vegetables, lentils, and pecan pesto can all be made ahead of time. Just store them in the fridge until you are ready to stuff and roll your strudel! Phyllo dough can be a bit finicky, but the trick to make it easy to work with is to make sure it stays moist. Drape a damp cloth over the sheets whenever you are not actively using them. I agree, Tofurkey, no thanks! But this, a savory strudel? I’ll take it! So glad we’re on the same page with this! I am putting this on my menu plan this week! I also feel as though it would be a good make-ahead item, I am assuming it would freeze well and you could bake from frozen. I haven’t tried freezing them, but definitely report back on how it turns out if you do! Thanks so much! It’s definitely a Thanksgiving winner! This looks insane! Love the addition of pecans and would love to make this mini portion sized! I think you could totally mini strudel this, or turn it into hand pies! The earthy flavors of the lentils paired with the sweet veggies definitely makes for a great combo! A savoury strudel – what a super idea! It looks beautiful, certainly not just for veggies or thanksgiving. I might have to make this for a midweek supper! I totally ate it as a midweek supper and it was DELICIOUS. Perfect for any occasion, really! I love this! We don’t celebrate Thanksgiving, so I’ll save this recipe for Christmas time. Such a great idea! I think it would be perfect for Christmas as well! Totally agreed – I LOVE Soyrizo, but all that other stuff is way too synthetic. I’d much rather eat real food! I’m so glad you’re excited about it and you’ll have to report back on how you like it! I think the filling would do great on it’s own without the phyllo if you wanted to set some aside for the GF! This vegetarian has never eaten tofurkey, I rank it up there with vegan cheese…bleck! I adore lentils though, and I’m loving this tasty strudel! Perfect for the Thanksgiving table! Down with Tofurkey! I totally agree. I’d much rather eat real food! I ended up making some changes to this the second time I made it since the first time was a little overpowering to my family. We actually just made it without the dough and served it like a casserole instead. The changes we made were to replace the parsnips with sweet potato (turns out we don’t like parsnips) and replaced the goat cheese with tomato basil feta crumbles (goat cheese was way too strong for us). So the second time we made this, it was much improved for our tastes and we are planning to make it that way again for Thanksgiving. I plan to roast the veggies at home and put it all in the casserole dish and then when we get to my parents house for dinner, we’ll put the dish in the oven to meld the flavors together and heat it for dinner. This looks great! Can I roll it in the dough ahead of time so all i have to do is pop it in the oven when it comes time? Hi Kim! Fillo dough can be a bit tricky and if it dries out in the fridge before it bakes it might start to break and crack and just be generally less pliable. The rolling itself was pretty quick, so I would recommend having the filling totally prepared ahead of time and then just rolling it right before you bake it.